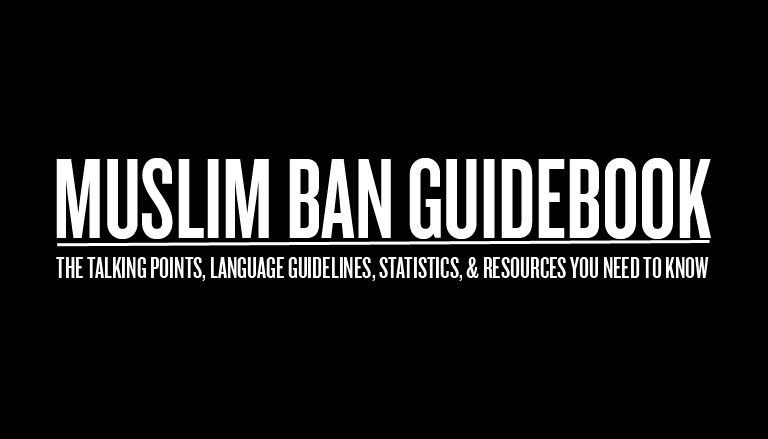 The Muslim Ban Guidebook will be updated on an ongoing basis. Update: Mental health resources for Muslims have been added to the guidebook on page 11. During his presidential campaign, candidate Donald J. Trump called for a “total and complete shutdown of Muslims entering the United States—until our country’s representatives can figure out what is going on.” If you recall, Muslim Girl decided to temporarily suspend its coverage of Trump to recenter our voices in these ongoing conversations. That’s also when we had to publish the Crisis Safety Manual for Muslim Women just to navigate surviving the rise in Islamophobic tensions. A year later, President Trump has commenced the initial process of following through with his promise, planning to put in place a “ban” that will likely restrict rights and opportunities for thousands of immigrants. The seven Muslim-majority countries currently being targeted include Iraq, Iran, Libya, Somalia, Syria, Sudan, and Yemen. We couldn’t let this happen without creating a go-to resource to help you, your families, colleagues, and friends in taking part in the conversations ahead. Here is a guide that includes statistics, glossary terms, talking points, summaries, and more. Consider it your CliffsNotes to the “Muslim ban” and more. This, more than ever, is the time we stand united. This is the time to reclaim our rights. This is the time to learn about what our rights are, and know how to invoke them and safeguard them, so that no president or administration can erase us from a country that we helped to build, grow, and prosper. This is also the time for our allies to step up, speak out, and fight. Scroll through to read the Muslim Ban Guidebook. Ever Wonder What Happened to the ‘Afghan Girl’? Not really a Muslim ban … Remember Saudi Arabia was the birthplace of most of the 911 attackers yet the Saudis aren’t on the list… By including Iran Trump has shown that its not about terrorism at all ….. He has business relations with them that’s why. Cutting off Saudi Arabia would mean no benefits no oil for him and would make the reason why he became president pointless (to grow his business and become powerful and rich). Thanks for the guidebook. Ignore the trolls, it only means your something they are afraid of. I never knew there were so many scared, small minded, white men in America.